The full article begins here. First, let’s have a look at why we chose the Verizon 4G Wireless Internet service and why you may be interested in doing the same. Currently, we use AT&T/SBC DSL Internet. The service has been adequate over the years but speeds seem to fluctuate quite a bit. The people at the Verizon store claim that the speed of Verizon 4G blows away DSL both in download and upload speeds. In just a few moments, I will test this claim as I get the 4G device setup and compare it with our still active DSL line. Thus, speed is a factor in the choice. Another factor to consider was portability. This is where the Verizon 4G blows away home DSL. Obviously, your AT&T/SBC DSL or cable modem package is confined to the house. However, this Verizon 4G LTE that we just purchased, which is called MiFi by the way, comes in a little device that is about the size of an iPod Nano or about half the size of an iPhone. What this means to you and me is that we can take our Internet anywhere that we want to go! This is perfect for anyone who has ever said…“I wish I had Internet here. Essentially, this is cellular Internet. Thus, wherever you have cellular phone service, you also have Internet service. In our situation, this is ideal because we have two residences where we pay for DSL, which also requires us to pay a phone bill. Which brings us to another consideration with the Verizon 4G Wireless Internet: Price. Verizon 4G Internet costs about $50 a month. Since we we will be able to cancel two phone/DSL services, we are essentially trading about $140 a month for $50–not a bad deal at all…especially if it is faster. Finally, we need to ask the question: How many people can use the Verizon MiFi at one time? This was a big question as we looked at Verizon wireless. We currently have up to 3 laptops connected to our existing DSL (through a LinkSys WiFi Router) at any given time and we needed that capacity. From what I had seen of other “wireless solutions”, they all accommodated just one user connected via a USB wireless modem and, if you wanted more people connected, the solution would get more complicated. The Verizon 4G MiFi Mobile Hotspot device comes with built in WiFi that supports up to 5 users. Thus, you can get rid of all of your extra equipment (the router, the DSL modem, the cables, etc) and simply use this one device which is, again, less than half the size of your average remote control. Also, Verizon claims that the “WiFi” capabilities on this device have the same range (how far can you be from the actually device?) as other WiFi routers such as LinkSys. Before I open this little box that contains the MiFi device, I will tell you how I think the setup will go. It’s always a good strategy to think about how something will work before you set it up. And, in the end, you are usually right. I am guessing that we will need to plugin in the Verizon MiFi and then configure it via the USB connection to my laptop. During this configuration, we will probably use a default password provided by Verizon to access the device, and then we will be able to give our device a unique password and configure it’s WiFi name which will be the name that laptops see when they search for wireless networks. So, with these suppositions, we begin the setup of the Verizon 4G LTE Wireless Internet MiFi device. Step 1: Open the box. Ok, within the box, there is the MiFi device itself, a cover for the device, a USB connection cable, and something that looks like an AC Adapter but has no apparent plugs on the end (very strange). There is also just a 4-step instruction guide which has the initial password written on it–very cool. So, it appears, that we will simply plug this in and it will be ready to go. However, the plug has no prongs to actually plug it in–so let’s find out what that is all about. Ok, got it figured out–weird–the “prongs” for the plug are there but you have to connect them. It’s very easy, but strange. Step 2: Plug the MiFi in. Is this thing just going to work after I plug it in? Let’s see. Ok, I have plugged it in and hit the power button. I have a green light on the device now. Is it already working? Step 3: Ok, now I am going to try to connect to WiFi. 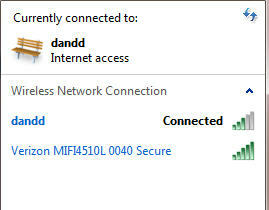 And–Volia!–the Verizon shows up in Wi-Fi as the “Verizon MIFI4510L 0040 Secure” as you see in the photo below. Wow, I am connected and it seems fast. I can honestly say that the setup of the Verizon 4G Wireless is the easiest product setup I have ever encountered. As I test this, we must remember that all DSL is not equal. However, what we have here is what most of you have at your house–the AT&T/SBC DSL package. First, I will test at this site, http://www.speedtest.net/ and then I will test at one other to account for any variances in these “speed test” web sites. The only thing that I can say about these results is: “Oh My!” Verizon 4G blows away DSL! The download with Verizon 4G is 16.5 times faster than the download with DSL. The upload speed with Verizon 4G is 5.2 times faster than with DSL. Verizon 4G is the clear winner in this test. Now, let’s try at one another speed test site to remove the “testing site” as a variable. I will do our next speed test at http://www.speakeasy.net/speedtest/. Let’s begin. This time, we will test Verizon first and then DSL. The download with Verizon 4G is more than 18 times faster than the download with DSL. The upload speed with Verizon 4G is 4.6 times faster than with DSL. I have to say that I am a bit shocked by these results. The salesmen at Verizon claimed that 4G was much faster the DSL but one assumes that may be bolstering their claims to sell you their product. In fact, they understated the speed of 4G compared to DSL. While they claimed speeds would be “10 times faster”, we can clearly see that speeds are greater than 15 times faster with 4G compared with DSL. Remember, DSL speeds do vary according to plan, location, and number of connections. I remember, several years ago, our DSL speeds were faster than they are now. For some reason, they have gotten a lot slower over the past couple of years. This doesn’t make much sense but that is how it has gone. As I mentioned above, we are currently deciding between DSL and Verizon 4G (Verizon gives you two weeks to decide). Thus far, Verizon is winning on price, the setup has been a snap, and the Verizon 4G MiFi simply destroys DSL in the speed test. The remaining test is portability. Verizon 4G beats DSL on the portability front because, well, DSL has ZERO portability. With the Verizon 4G, I already know that I can have Internet in two homes without paying two Internet bills, but I still have a few questions regarding portability. Does the Verizon 4G function if it is not plugged in? For instance, can I use the MiFi in the park? What is the range of the 4G Mobile Hotspot? Right now, our wireless router that connects to our DSL provides very good wi-fi range. Certainly, it works anywhere in the house and on the porch as well. So, with laptop in hand and the 4G connection active, I will roam around the house to determine the range of the Wi-Fi that comes with the 4G mobile hotspot. The test is now complete. The Wi-Fi that comes built-in with this Verizon Mobile Hotspot MiFi device provides similar coverage to the Wi-Fi provided through the LinkSys Wi-Fi router. I tested two floors of our house and access from outside on the porch. There was one notable difference that I found between our existing Wi-Fi and the Wi-Fi with MiFi. With the Wi-Fi through DSL, my Internet connection speeds are the same whether I have a strong Wi-Fi connection (5 bars showing) or a weak one (2 bars). This was not the case with the MiFi. The Internet connection speed slowed down as I got further away from the MiFi device. It was still much faster than DSL, but was considerably slower than when I had my laptop in the same room as the Verizon Mobile Hotspot device. This variation is interesting as it does not occur with traditional DSL Wi-Fit but does with the 4G Mobile Hotspot. Of course, in most situations, it won’t matter because you can place the 4G Mobile Hotspot anywhere in your house. It need not be located near a phone jack as does DSL. However, if you do have users far away from the device, note that connection speeds tend to slow down as you get further away. In summary, we purchased the Verizon 4G Mobile Hotspot because it seemed like a better alternative to our current home DSL solution that is provided through AT&T (or is it SBC–they keep changing?) Additionally, we have another residence where we also have DSL. Thus, if it worked, this Verizon 4G MiFi Mobile Hotspot device would enable us to trade two Internet payments for one. Additionally, the 4G solution would allow us to take our Internet anywhere we wanted to go. I evaluated this Verizon device on the 3 categories that mattered most to us: price, portability, and performance. The Verizon 4G mobile hotspot won in every category. In fact, the Verizon 4G wireless Internet solution was so much better that it did not even seem a fair competition. On top of that, the setup of this Verizon wireless Internet was a snap! Thus, if you are considering an alternative to DSL for your Internet access, the Verizon 4G Mobile Hotspot solution is that alternative. Verizon 4G is currently available in 45 markets and will be in 145 markets by the end of 2011. Soon, coverage will be available nearly everywhere. Check this Verizon page for 4G availability. Can I Use This Device Where There is No 4G? Yes, the MiFi Mobile Hotspot reverts to 3G where there is no 4G. The monthly bills for the Verizon 4G are $50. With a 2-year contract, the device itself currently costs $100. Fortunately, Verizon had just sent us a $100 coupon so we paid nothing for the device. Can I connect the MiFi device to my Linksys Router? People ask this because the MiFi Wi-Fi supports only 5 WiFi connections at one time and some people and small companies need more. There are many people who have done this. Visit this page to see the proposed solutions. I personally have not done this so I cannot vouch for the proposed solutions, but it looks to be possible. Can I Ask You a Question About Verizon Wireless Internet? 1. What about the data usage? I don’t download alot. Mainly I email, internet shop, Facebook, and game on Facebook. Would 5G be enough? 2. In my area only 3G is available. I know that would be slower, but would it be so slow I would feel like I was back to dial-up? I like the speed of the broadband I have now. Wow! this is a good review. But having such will still depend on the area. There are some areas that limit only to 3G. But then again, its up to people’s preferences. One must consider also its usage of the internet, its either you are into downloading heavy files or just merely fond of social media sites.